You knew this was inevitable. 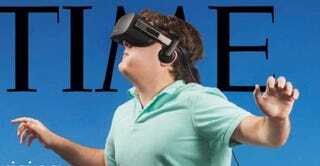 Let’s see if you guys can improve TIME’s fantastic August 17 cover, which features Oculus Rift CEO Palmer Luckey prancing like he’s never pranced before. Competition will be tough for this one, given how many people have already been ‘shopping it up since the cover came out earlier this week. I’ll be doing up the winners on Friday, not next weekend, so get your entries in by then.